The past few months have been decorated with reports of Microsoft stumbling at every hurdle they come across, most notably their lack of coordination between key marketing executives who aim to get the Xbox One's philosophy across to the masses. While they seem to have dodged the no-DRM bullet, it looks like Microsoft are about to transition into yet another slump, this time with their "Games with Gold" promotional campaign on Xbox Live. Many will know of the campaign after Fable 3 became free on Xbox Live for the month of June, and during E3, Microsoft announced that this was the first step in a long and fruitful partnership with Xbox Live subscribers. Games with Gold was, for all for all intents and purposes, Microsoft's answer to Sony's well documented PS+ incentives; which included a plethora of free games for paying subscribers. With the next-gen upon us, Microsoft seen now as the time to strike; by offering their subscribers a library of free games, they hoped to regain the trust of their customers and give them a shining reason why the Xbox One is the console to have. During E3, Microsoft also announced the new Games with Gold program would kick off with Assassin's Creed 2, and Halo 3. Yusuf Mehdi: "To kick off that program I'd like to share just two of the titles that we're going to offer over the next few months...Assassin's Creed 2, and Halo 3"
The announcement of these two titles circulated a reasonable deal of hype amongst Microsoft fans, with many subscribers looking forward to the 1st of July to get one of the titles. However, Microsoft look to have once again delivered a great deal of disappointment by announcing that July's first (of two) free game will be the 2009 XBLA title Defence Grid: The Awakening. As expected the backlash has been mounting over the past 24 hours to an almost nauseating level, and Microsoft have already hit back, via Major Nelson. Despite Major Nelson's above statement, Yusuf Mehdi did explicitly say "To kick off"; which obviously lead any common-thinking person to the obvious conclusion that both these title would be part of the program's inaugural month. 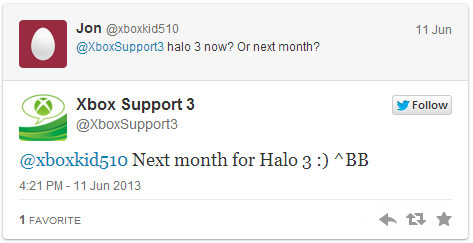 Furthermore, various other sources, including the official Xbox Support Twitter have been spotted stating that Halo 3 was part of this promotion. So what the hell is going on at Microsoft!? Regardless of whether or not Halo 3 and Assassin's Creed will be free this month, both titles still aren't good enough to really push this campaign to the level of Sony's PS+. While Sony are offering fans the likes of XCOM: Enemy Unknown and Saint's Row 3, Microsoft are offering outdated first party titles that barely made a blip on the map - such as Fable 3. Once again Microsoft have displayed an alarming inability to iron out the simplest details, and many of us will be left wondering how long we're expected to put up with this mess...Only time will tell. Source: Me via FPS General.